Heroes, Heroines, and History: Sarah Josepha Buell Hale: The Godmother of Thanksgiving. Sarah Josepha Buell Hale: The Godmother of Thanksgiving. Welcome to Heroes, Heroines, and History. Michele Morris here. As many of you know, I love to research, write, and read about strong, historical women. One such woman, Sarah Josepha Buell Hale, has been called the "Godmother of Thanksgiving". Born in New Hampshire in 1788, Sarah and her siblings were home-schooled. She gave her beloved mother credit for hers and her siblings extensive education. A prolific reader, Sarah noticed that the books she read, few were written by Americans and none of the books she read were written by women. Early in her life she was motivated to do something to promote women and to advance her country and continuing her education became her ambition. Because women were not allowed to attend college, her brother Horatio Gates Buell shared his Dartmouth textbooks with Sarah so she could further her education. By the age of eighteen, Sarah began teaching school. After six years of independent living, Sarah married lawyer, David Hale. He encouraged her “mental pursuits” and the couple lived an idyllic life until 1822 when David died from complication of a stroke. The widow, Sarah, had five children under the age of seven to raise on her own. After much thought how best to accomplish this and also keep her independence, Sarah published her first book of poems. 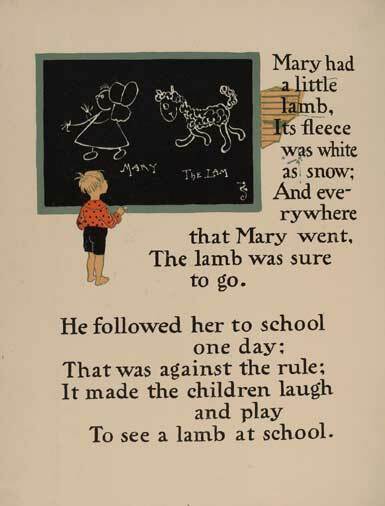 In 1830, she published her second book of poems; Poems For Our Children. 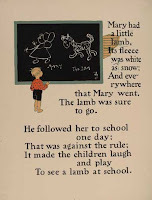 This volume contained the famous American poem “Mary Had a Little Lamb”. However, it is debated if Sarah actually wrote the poem. In 1828, a couple years before her second book of poems was published, Sarah became editor of the Ladies’ Magazine of Boston. The first magazine edited by a woman for women. 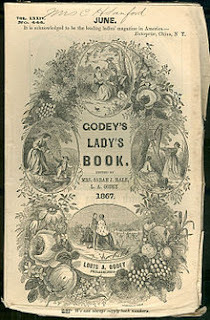 In 1837, the Ladies’ Magazine merged with the Lady’s Book, a magazine published in Philadelphia by Louis Godey. Sarah was hired as literary editor of the magazine. Eventually this magazine would become known as Godey’s Lady’s Book. Under her guidance, Godey’s would become the most widely read magazine of the 19th century and Sarah one of America’s most influential voices. Also in 1837, Sarah wrote the first of her Thanksgiving editorials. Praising the holiday for its “domestic and moral influence”. 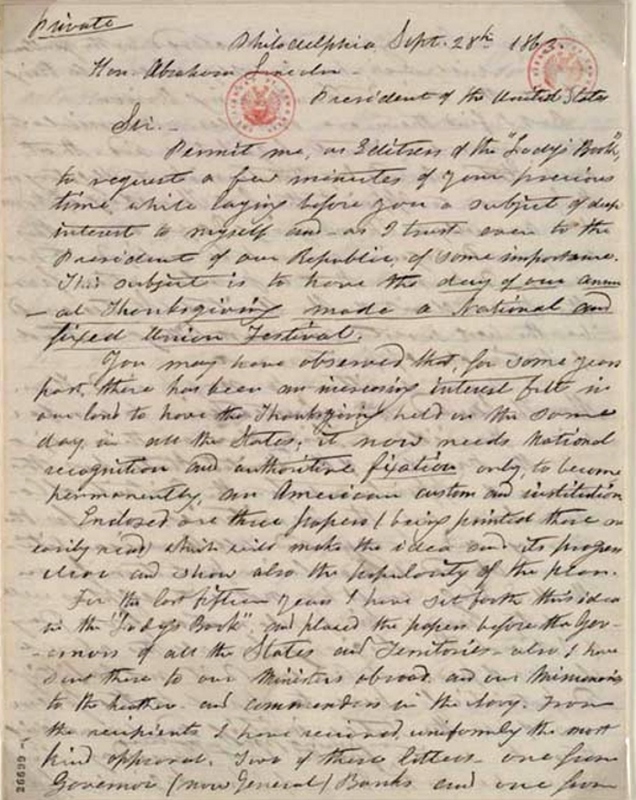 Though she continued to write editorials in favor of an official Thanksgiving holiday, it was in 1847 that Sarah’s crusade for a national Thanksgiving holiday began. 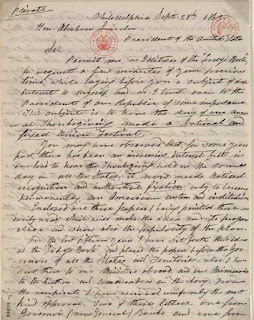 On October 3, 1863, President Lincoln issued a proclamation that urged Americans to observe the last Thursday in November as a day of Thanksgiving. More than twenty years after her first editorial, Sarah had finally accomplished her goal. Sarah Josepha Buell Hale retired from her editorial duties in 1877 at the age of 89. She died in her home on April 30, 1879 and is buried in Laurel Hill Cemetery in Philadelphia, Pennsylvania. Thank you for stopping in to visit today. I hope you are as inspired by Sarah's life as I am. I wish you a very happy Thanksgiving Day and a safe and blessed Christmas season. Michele Morris has always had a love for the written word. She fully expects that someday her family will hold a book-hoarding intervention in her honor. Her love for historical fiction began many years ago, when as a child, Michele could often be found hiding under the bedcovers, late at night, with a book and flashlight. She has since graduated to a tablet, but nevertheless, a good book can keep her up until the early morning hours. 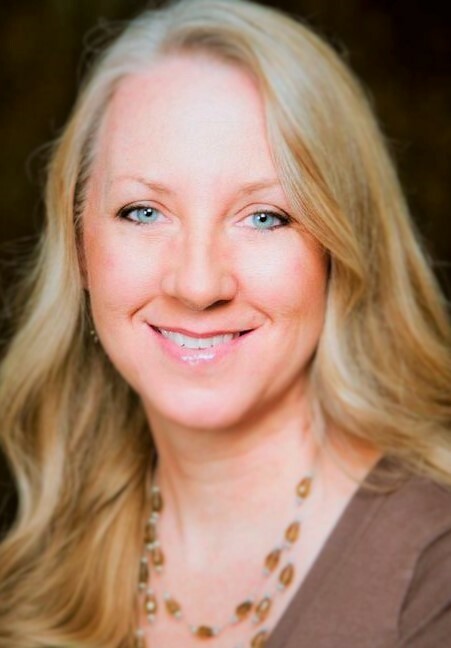 Michele writes Historical Romantic Suspense and is working on her third novel titled, The Manhattan Solution. Happy Thanksgiving, Michele. Thank you for a delightful post. 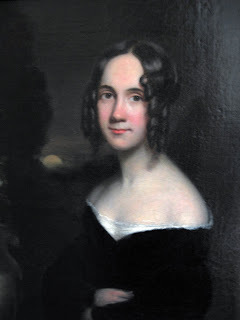 Sarah Hale is truly an inspiring woman. Happy Thanksgiving to you, Linda! Thank you for the sweet comment! I didn't know about her connection to Thanksgiving! Thanks for a fascinating post. One of my most treasured old books is a bound edition of some 1870s Godey's. Thank you, Stephanie! Oh, my goodness, that is a treasure! Happy Thanksgiving! Thanks, Michele. This is all new to me so I enjoyed reading it. Happy Thanksgiving! Happy Thanksgiving, Anita! Thank you, I'm glad you enjoyed the post. Sharon, forgive me for replying sooner! I agree, the women from years ago where often expected to be meek and go unnoticed. Those who braved to be more must have had incredible courage. Thank you for the comment!